I started a portrait of Benedict Cumberbatch after carefully selection an image from more than a dozen I downloaded over the past fortnight. The selected image looked good as a photograph but presented a challenge when I started drawing it because of the grain. I downloaded a few other images which I could use as a reference for hair and eyes and instantly I liked this image. However, since I had already started, I stuck to the old picture but halfway through I was disappointed enough to tear it apart. There was not enough likeness and the drawing started looking like that of Akshay Kumar. I guess I was destined to draw this image instead, so here it is. 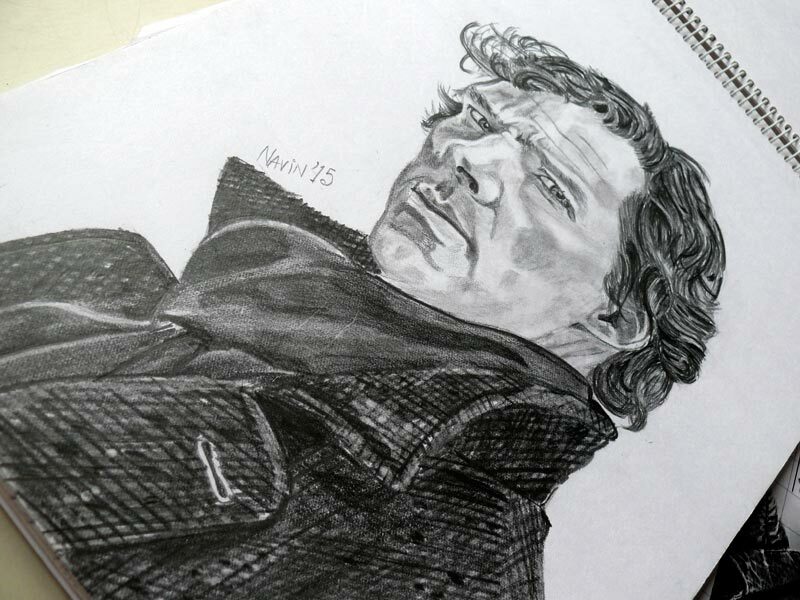 After Robert Downey Jr., this is my second Holmes portrait. I want to draw my favority Sherlock Holmes Jeremy Brett as well but have not found a pictures that I liked enough. "Sometimes a man meets his destiny on th road he took to avoid it." - Wilhelm Wexler (Armin Mueller-Stahl) The international.